I’m only going to talk about the two characters that are with you throughout the bulk of the adventure. There are many others who join and leave the group, but I don’t want to spoil any story elements. Shulk is the main character, and someone that I really like in this sort of game. Like Vyse in Skies of Arcadia he isn’t some whining emo kid who hates everything and grows in to a leader. Shulk likes a challenge and wants to explore the world. Other characters are drawn to him because these traits. I confess to having a man-crush on Reyn. He is Shulks unwavering bone-headed friend with a massively over-the-top cockney accent. Reyn wants to protect and help Shulk, and also provides a lot of humour in the game. The way he interacts with some of the other party members later on is great. I can’t think of a better side-kick for the story, and watching he go crazy when Shulk gets hurt or shouting “we’re gunner knock your block off!” before a chain attack always makes me smile. 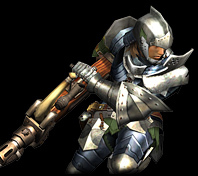 Reyn should be given a spin-off game, and possible a prime-time talk show. I don’t want to give much away, but I’m sure everyone knows that the story revolves around the two giants the game takes place on. Having the world having such a central role is great. It’s not just a land you have to save for the people that inhabit it, but a living breathing character of its own. All the areas are different parts of the giant, and this connects you to the world even more. For the group of main character it starts with a simple story of revenge against the Mechon (beings from the other giant) for an attack on their home town. However, as the story progresses they become involved in something much larger. Shulk is able to see the future using his sword. This element drives the story forward and gives real weight to events. Seeing a friend die before it happens instils a real sense of urgency, and the emotional impact of being unable to stop something he had a premonition about can make you feel useless and helpless. This device is used enough to drive the story and combat, but not so much it feels forced. Everything about the gameplay if fluid. Standard attacks are automatic, with a choice of special moves to use when the time is right. Most of these will deal more damage if you are in the right position (behind, next to or in front of the enemy). It felt more like I was managing the team in battle, rather than just using one character. Depending on your character level enemies will either attack you on the field, or leave you alone. Most areas have enemies which are far more powerful than you when you first arrive, sometimes running is the best option until you are stronger. Some of these enemies are stronger than the last boss, so you have the option of exploring and fighting new enemies before finishing the game. Shulk can see the future in battle, alerting you to major attacks or the death of an ally. These can be stopped by meeting certain conditions in battle and really add tension. There’s nothing worse than fighting a difficult boss only to see them launch a massive attack in a few minutes time. If you don’t have the skills available to save one of your party from dying you can save healing and revival skills to bring them back ASAP. The mechanic adds a lot more strategy and drama to the fights. This is one of the best looking Wii games. I love the art style and draw distance. I spent a lot of time just looking around, especially in some of the bigger areas. Most places have view-points hidden away, and from these you can see parts of the giant you are on. It’s a lot more interesting to see a massive head or arm with the rest of the world covering it than a flat plain. You can also see the other giant from some places. This really gives you a sense of scale. Voice acting is all in British accents. As an English person I’m really enjoying this trend for Wii RPGs. Sometimes stereotypical American accents get a bit too much. Most of the accents in Xenoblade are a bit OTT, but that adds to the humour. All the characters are voiced well, with everyone sounding like they should given the situation they are in. One of the characters who joins the group later is a bit annoying, but everything else is done well. The music is great. I would happily have some of the tracks on my iPod. As mentioned above, there are enemies in the field which will really push you. Even when you are near the level cap. I have been to look for these in most areas, and found new places to explore while doing so. Many areas are a lot bigger than you think, and sometimes you miss places because the areas look so organic. Exploration will usually lead to finding a path to new area, or a new way to get to somewhere already found. I can’t recommend Xenoblade enough. Everything from the world and story to the battle system is fantastic. I know that for many Zelda will be the Wii’s swan-song, but for me it’s Xenoblade. I don't think you should own a Wii and not consider picking this and The Last Story up. Now, to me, The Last Story seems rather poetic and fitting as the Wii's curtain call. If you'll allow me some constructive criticism: your review could use an opening paragraph. It may not seem necessary, but there is a reason they ask you to have one in any essay assignment you might get in college: they help ease the reader in and prepare him for the way the text will unfold. Same with a review. Opening with just "Characters" is a little dry. Cheers Guillaume. I had to write this really quickly, and didn't have chance to review it before posting.